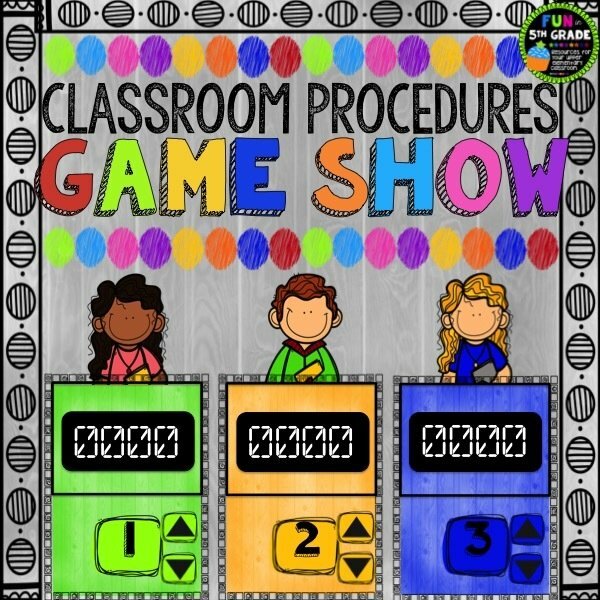 Digital Resource Shop – Classroom Procedures & Routines Game Show – Misc. 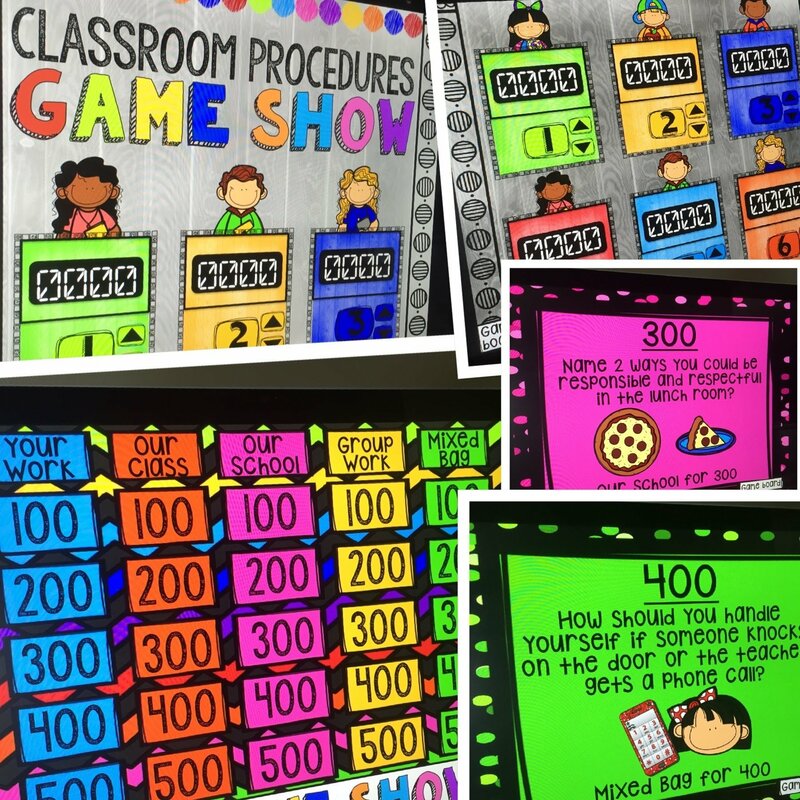 Classroom Procedures Game Show is a fun way to review classroom procedures with your class at the beginning of the year, after a break, or any time they need a refresher! 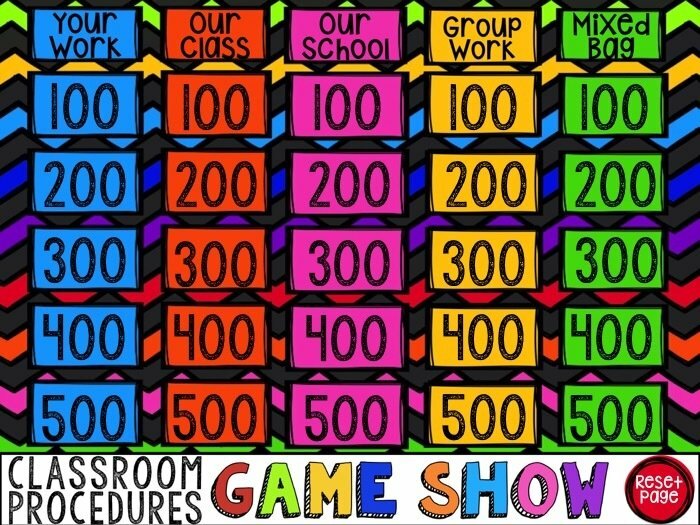 ☆Put students in up to 6 groups to play this Jeopardy style game! Classroom procedure talk can be dull and kids just don't pay attention. But, if you tell them that afterwards you will play a FUN review game to test their new knowledge, they will make sure to be listening to your every word. ☆Test it before you buy it...especially if you plan to run this game on a MAC. Click here to test the sample file. MAC users please read the bottom of this description for more info. NOW EDITABLE so you can change the questions ONLY! 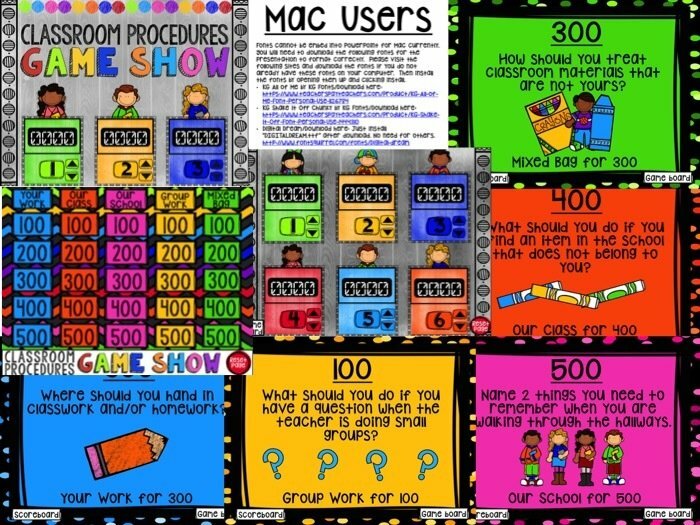 Watch the Game Show Powerpoint Video to see how it works! I play this game a little differently. I like to have all students ENGAGED and REVIEWING every question. So, I do this by having them answer every question. One team chooses the category and amount. EVERYONE answers the questions with their groups and records their answer on their whiteboards. The team whose turn it is show me their answer and if correct, I award them the points. If incorrect, any team that has the correct answer can go for the steal and get the points for that question. Then the next team gets to choose the category and points. ✓Optional editable versionwith ANSWER SLIDES for you to add your own custom answers! ✓Scoreboard slide where you can track points for each team with a WORKING SCOREBOARD! ✓Buttons on EVERY SLIDE that will take you back to the game board or scoreboard. ✓Reset Page buttons on the scoreboard and game board. ☆PLEASE NOTE: You WILL NEED to enable macros for the presentation to work correctly. Instructions are included. Most computers ask you right when you open the file so it's super easy. If it doesn't, just follow the instructions in the "Instructions" PDF file included in the download. ☆This is a POWERPOINT file and can be used on any computer with Powerpoint. 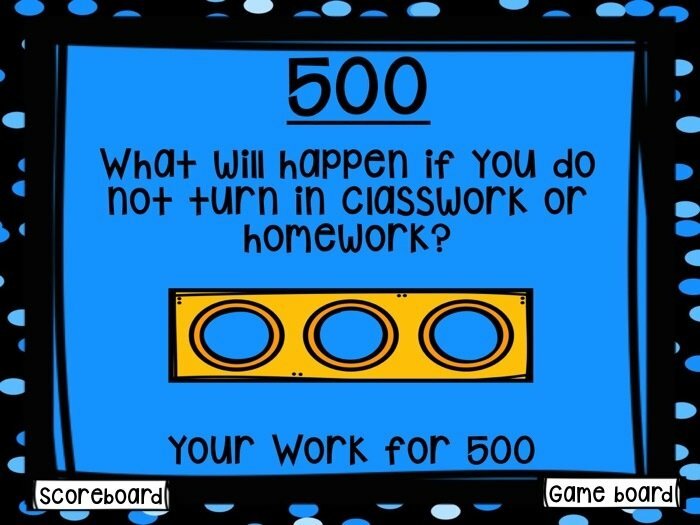 I have an interactive whiteboard and display it on that with no problems. Students love to come up and click on the categories! YOUR WORK: struggling with an assignment, unfinished work, where to hand in work, incomplete work, what if you don't turn it in? 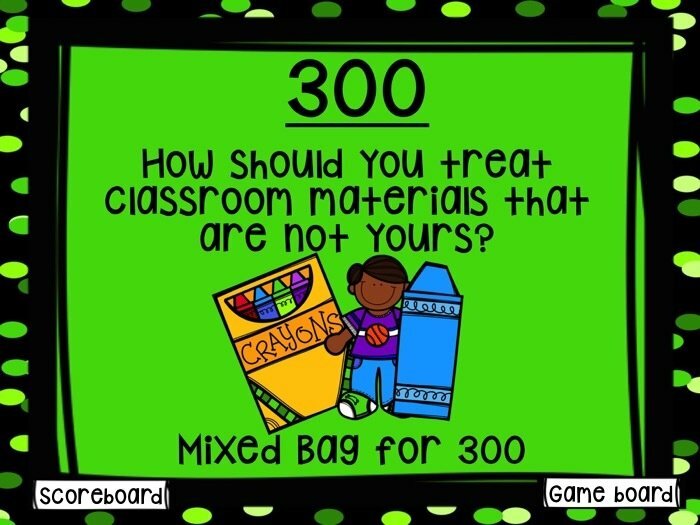 ☆Please, if you have any issues or problems after purchase, I have included my email to contact me so that I can help you get this FUN and ENGAGING game started in your classroom! MAC USERS PLEASE NOTE: Please test it out BEFORE you buy! →Please test to make sure this game works on your computer by downloading the Sample Game Show Test File! ***Click here to do that*** There seems to be an issue with buttons working correctly only with the MAC version of the most recent update to PowerPoint. So let me help make sure that it will work properly on your computer before you buy. 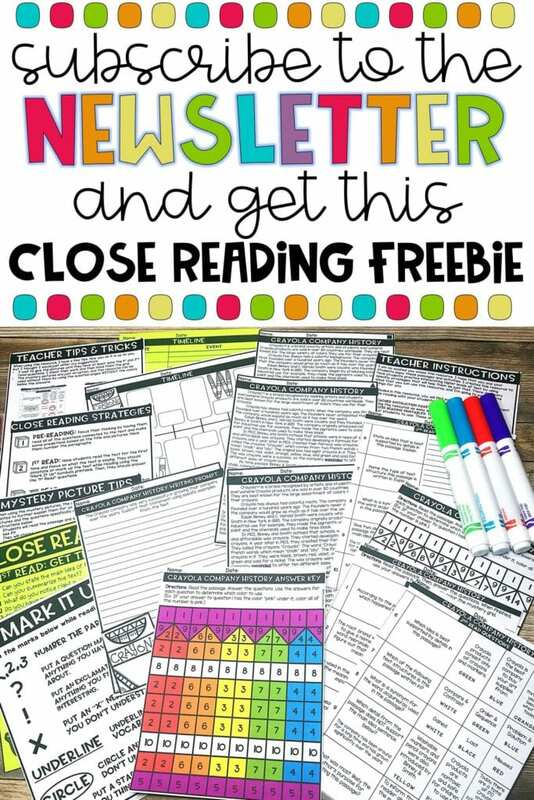 Try the sample file and email me at angie@funin5thgrade.com if you have any issues. Thanks so much. →PowerPoint version 2008 for MAC does NOT support the use of macros which is what this presentation uses to make the scoreboard and game board work. Please visit this site to see how to check this, if you are not sure. →Please do not purchase unless you are ok with adding 3 fonts to your computer. Mac Powerpoint will not allow the fonts to be embedded. Instructions are included and I do tell you where to grab the fonts.